The EDS-02D1 single seat and EDS-O2D2 2 seat gliders Systems enables the general aviation pilot(s) to fly at pressure altitudes up to 25,000 feet with safety and comfort. The EDS-O2D1 and EDS-O2D2 digital Pulse- Demand™ systems reduces Oxygen consumption dramatically. Different from the "standard" constant flow systems, the EDS-O2D1 Pulse-Demand™ system wastes no Oxygen during the breathing cycle when oxygen is not being delivered to the lungs. The average user will enjoy a duration increase of two to three times compared to the constant flow systems. The built in Barometer adjusts for Altitude increase while reducing the pilots work load. The low-pressure service line is a high quality polyurethane line that is kink-resistant and flexible under varying temperatures. The cannula, face mask and service line connect to the EDS unit via color-coded "Quick-Connects" providing an air-tight fitting by hand. These fittings can be connected and disconnected many times. Comprising Mountain High EDS-O2D1-2G pulse demand system, a face mask and 2 x cannulas with a travel bag. Suitable for those with an existing cylinder and Mountain High regulator setup - please contact us before purchase if in any doubt. 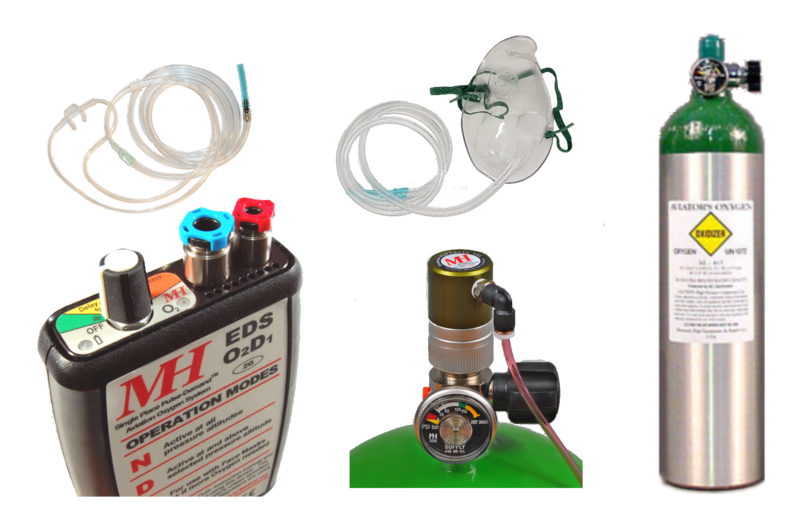 Comprising Mountain High EDS-O2D1, steel 100mm diameter cylinder (often for use with DG, LS and ASW gliders), Mountain High DIN-477 regulator with gauge, 1 x face mask and 2 x cannulas with a travel bag. Comprising Mountain High EDS-O2D1, aluminium cylinder, regulator, mask and cannula with a travel bag. 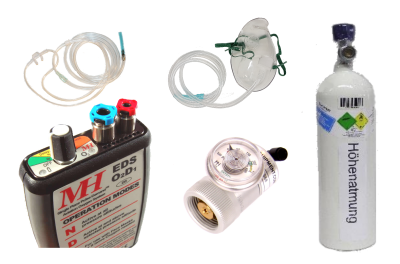 Comprising Mountain High EDS-O2D1, Kevlar, Carbon or Silica cylinder (for reduced weight and durability), regulator, mask and cannula with a travel bag.